The cultural network "European Mozart Ways" (EMW) founded by an initiative of Land Salzburg on the occasion of the 250th birthday of Wolfgang Amadeus Mozart in 2006 combines authentic visited Mozart cities, towns and sites in ten European countries. See: www.mozartways.com. Mozart traveled more than half of his life; a fact which has contributed significantly to the development of this great representative of Western musical culture. The Association "European Mozart Ways" has been entitled "Major Cultural Route" as part of the cultural route program of the Council of Europe. They are the only Cultural Route that represents a musician in the center of its activities. "On the way to Mozart" - "Young Mozart Ways". The person W. A. Mozart, his life, his work and his European-style personality should be made tangible for children and young people. What Mozart means for each of us, in what way he could be inspiration and an example and why his life and his work are so unique should be discovered through creative approaches in musical, pictorial and creative, "young" activities ... and perhaps be experienced for the first time. Through the exchange without national borders also important objectives of the European Community can be implemented. For all projects the young people are expected to come into direct contact with artists, musicologists and Mozart experts. Results of the projects are presented on the web portals of the EMW www.mozartways.com or www.communicating-music.eu and posted on Facebook. Along the "European Mozart Ways" Children's and Youth Choirs or Children and Youth Orchestras, which have in their repertoire works by Mozart, will be appointed as "Young Ambassadors of the European Mozart Ways". Thus the idea of the European Mozart Ways should be approached to youth and be brought amplified to the local and regional population. In long-term exchange programs such as meetings, possibly competitions, travels of choirs to other partner cities should be implemented - each supported by contact addresses and persons on site. The exchange at the European level, the more intensive examination with Mozart as a cultural figure on the occasion of such events and the development of common projects are important aspects of the project. •Domkapellknaben und -mädchen Jugendkantorei at Salzburg Cathedral, Salzburg/Austria, 2016. As part of school projects video productions, musical and scenic performances in duration about 5-10 minutes should be developed. The preoccupation with the personality of Mozart, his experiences in the European cities and towns inhabited and visited by him as well as its effect and its possible importance for young people today are the main focus. The implemantation occurs with a cultural technology (Film / Video "(moving images and animations), which is open to all young people and used in everyday life. It should arize the interest: why Mozart, classical music?, who was this genius, what is behind this genius?, what does he/his music tell us / young people today ?, Mozart was born in Salzburg - so what ? ; what do we do with this great heritage? ... Perhaps there are valuable information, "word donations" of musicians or else passers ...? Every city, every place, W. A. Mozart had ever visited or lived in, has experienced one or more typical "stories" with him. And children love stories. They should be excited by this project approach to search for such stories and to note them in the form of a written story. The result over time will be a young image of his life, his history, of cultural European heritage, a short history with Mozart respect along the European Mozart Ways. Along the European Mozart Ways one-week courses for children of two countries are offered, which combine language lessons with singing together and making music. W. A. Mozart's life and its respective residence should be taught as part of the week long stay as well. Music as common language is the main focus. A first project cooperation between Salzburg and Rovereto / Trentino is planned for spring 2017. 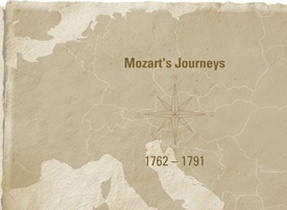 The European Mozart Ways are an international network connecting cities, regions and institutions in 10 European countries visited by Mozart during his travels, which covered over half of his lifetime and contributed in a most decisive way to the constitution of this unsurpassable figure of Western culture.